Hum Jo Tareek Rahon Main Maray Gayay is Faiz’s masterpiece poem inspired from the letters of Ethal and Julie Rosenberg. 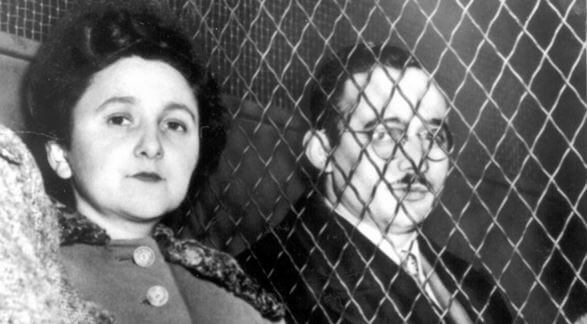 During their trials and imprisonment, Ethal and Julius penned their experience which are known as ‘Rosenberg Letters’. Despite the imminent capital imprisonment looming on their heads, they faced their trials with exceptional patience and compassion and remained sanguine about humanity and victory of truth. Download recitation of Faiz’s beautiful tribute to Julie and Ethal in voice of Zia Mohyeddin, ‘Hum jo Tareek Rahon Mein’ [with courtesy and permission of http://www.thesufi.com ]. Also below in the text of their final letter to their children , which they wrote hours before their execution on 19 June 1953 via electric chair. Only this morning it looked like we might be together again after all. Now that this cannot be, I want so much for you to know all that I have come to know. Unfortunately, I may write only a few simple words; the rest your own lives must teach you, even as mine taught me. Your lives must teach you, too, that good cannot flourish in the midst of evil; that freedom and all the things that go to make up a truly satisfying and worthwhile life, must sometime be purchased very dearly. Be comforted then that we were serene and understood with the deepest kind of understanding, that civilization had not as yet progressed to the point where life did not have to be lost for the sake of life; and that we were comforted in the sure knowledge that others would carry on after us. We wish we might have had the tremendous joy and gratification of living our lives out with you. Your Daddy who is with me in the last momentous hours, sends his heart and all the love that is in it for his dearest boys. Always remember that we were innocent and could not wrong our conscience. P.S. to Manny: The Ten Commandments religious medal and chain and my wedding ring–I wish you to present to our children as a token of our undying love. Please be certain to give my best wishes to _________. Tell him I love and honor him with all my heart– Tell him I want him to know that I feel he shares my triumph– For I have no fear and no regrets– Only that the release from the trap was not completely effectuated and the qualities I possessed could not expand to their fullest capacities– I want him to have the pleasure of knowing how much he meant to me, how much he did to help me grow up– All our love to all our dear ones.